It is a cool project is you are starting with Arduino and you have interest in audio, guitars, effects and digital music. It is interesting if you dont have much experience soldering electronics as they are simpler (and fewer) than in the DUE. The general assembly is cheaper than the DUE and Pedal-Pi. The time related effects are reduced because of the small amount of RAM in the Arduino UNO. So, effects like delay and echo are impractical, distortions are great in the other hand. The circuit is just a fraction more complicated than the UNO model but this one includes a 128x64 OLED screen that helps a lot to interact with the pedal. Its processor is more advanced than the UNO, so you have a bigger variety of effects. The delay related effects are still better in the DUE. The OLED screen is fun, you can use your pictures and know the levels and variable values in real time. The time-related effects (echo, delay, reverb) are better than in the UNO but the DUE is still the best. It is a nice project if you are a bit familiar with soldering or you build some electronics before. The circuit and general functionality/coding are a bit more complex/advanced than in the UNO. More guitar effects available than in the UNO, specially time related ones. The Arduino DUE board is very powerful, including loads of RAM and 84MHz ARM processor. It is more expensive than the UNO assembly. It is more difficult to troubleshoot in case that you have problems with the circuit. It is an interesting project if you are familiar with software development, Operating Systems, Raspbian, etc (or you want to learn about). Building the board is more complex than the UNO but simpler than the DUE. Some skills soldering are required. The amount of RAM is virtually unlimited, so it has great hardware to develop time related effects. The kit is more expensive than the UNO or DUE assembly. The software is more difficult to troubleshoot due to other factors like the OS. 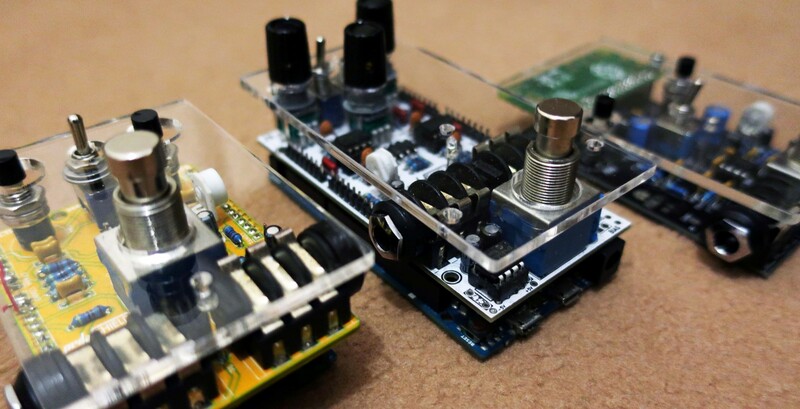 In a nutshell, if you are starting and you don't have much experience building electronics, I would recommend building the pedalSHIELD UNO; it is fun, simple, works, looks cool and it is cheap (especially if you pre-own an old Arduino UNO board). If you can afford it, the MEGA has a bigger library of effects than the UNO, and the OLED gives it flexibility to play and debug. There is plenty of tutorials on the forum to use your own images. If you more experience/confidence building electronics and you want to experiment and play with ADCs, DACs and digital signal processing to investigate and learn about digital audio, go for the DUE. If you like Linux, OS and software development Pi-Pedal is the best, the circuit complexity sits between the UNO and the DUE and the amount of connectivity, RAM and possibilities are great. This project has a lot of fields that are not explored yet like baremetal programming, RTOS, etc. In terms of sound quality they are not very far away one from each other, it has to be said that none of the boards (Arduino or Raspberry Pi Zero) were initially conceived to be used as digital signal processors for audio, but they dont do a bad job after all and it is fun to hack objects and mod the functionality. In my opinion, Pedal-Pi has a "good" sound followed closely by the DUE. Believe me, the UNO sound quality is not miles away from the other two, but the simplicity (also easier to troubleshoot) makes the output signal maybe a bit less defined. Last Edit: 9 months 2 days ago by Ray.